The Three Little Fish and the Big Bad Shark is a retell of The Three Little Pigs. When three little fish leave home to make it on their own, they soon learn about the Big Bad Shark living in the deep. Repetitive text, "Little fish, little fish, let me come in. Not by the skin of my finny fin fin" makes this a perfect addition to your shark week read aloud library. There was an Old Mermaid Who Swallowed a Shark! (An Amazon affiliate link is provided). by: Lucille Colandro is a great addition to the "Old Lady" book series. Speech therapy targets can include vocabulary, sequencing, linguistic absurdities, character traits, story retell, rhyme and rhythm, phonemic awareness and so much more! You can download the book companion HERE. This shark hat found on Pinterest is simple to make. You can add some visuals for following directions during the craft and then allow children to "swim" like sharks. There are several different versions of the tune "Baby Shark" on YouTube. My favorite version is by Super Simple Songs.The interactive song is engaging and repetitive. Let your little ones wear their shark hats for added fun. National Geographic for Kids is a great resource for older students. High interest topics can range from animals to historic figures. 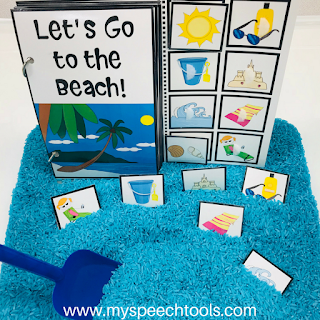 Speech therapy goals can include: reading comprehension, facts and details, compare and contrast, text connections and Tier 2 vocabulary. Read about the great white shark, watch a video, and boost research skills by visiting the National Geographic for Kids website HERE. Shark Bite is a snapping fun game for children to play. Players roll the die and take turns fishing for items out of the shark's jaws. Players never know when the jaws will clamp shut. 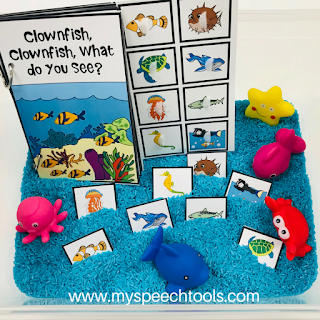 This game is easy to set up, doesn't require batteries, and can be modified with simple turn-taking an requesting visuals or switches to accommodate communication needs. (An Amazon affiliate link is provided). I love using adapted books in therapy. 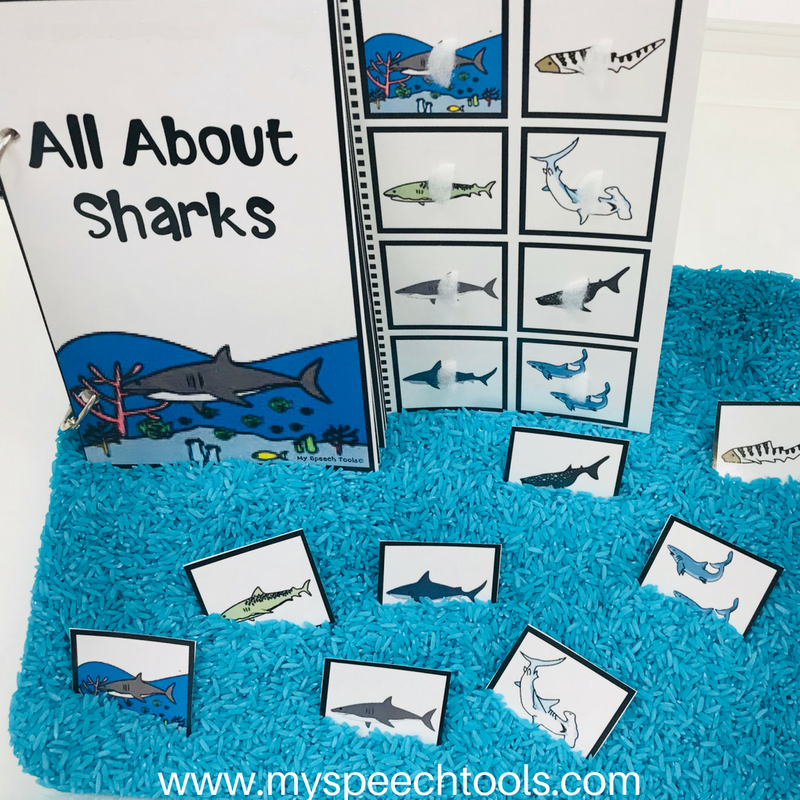 All About Sharks is a non-fiction science-based adapted book that will help students learn basic high-interest topic specific vocabulary, build background knowledge and provide opportunities to use core vocabulary while interacting with text. Finally, sensory play always a great addition to any theme. 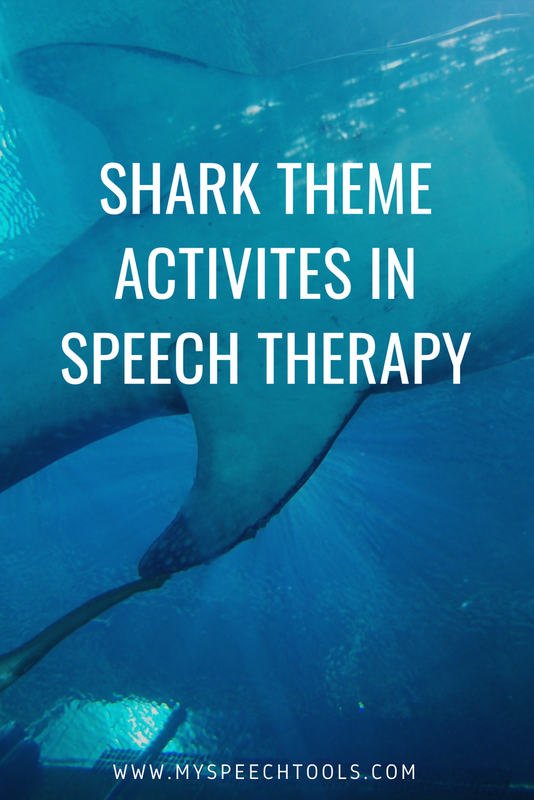 Create a shark sensory bottle, or allow children to explore sand and water through play. The language learning opportunities are endless. Link below to view more ocean theme adapted books. You will find these books and "There was an Old Mermaid" book companion on sale during shark week beginning, July 22nd. Don't miss out on this opportunity grab these amazing products on sale! To purchase gently used copies of books mentioned in this post search Thriftbooks by clicking on the following link:Used books for as low as $3 each (A Thriftbooks affiliate link). Don't forget to sign up for my email list and follow my blog. You'll receive new posts directly to your email address. Don't miss a single post.